Wouldn’t it be wonderful to be able to afford all of that fancy equipment used in the gyms? Well, as nice as it sounds, it just isn’t an option for most people. And since exercise is so important, you need to find exercises that are effective and don’t require any equipment at all. To make these exercises even more fun, you can blast music while you’re doing them. Some you can even do while watching TV. Walking – If the weather is nice, it’s wonderful to get outside and enjoy the scenery around you while you exercise. However, if the weather has other ideas, you can just as easily get an effective walking workout at home. If you have a flight of stairs, go up and down them a few times. (You could even grab a load of laundry as you’re going that way anyway!) This will help to tone up your legs, while getting some low impact aerobic exercise as well. If you don’t have any stairs available, just walk around the house a few times – it may not be very exciting, but it will do the job! Jumping Jacks – These are always fun, as they bring back memories of being a kid! Who hasn’t done jumping jacks for fun as a child? Well, surprise – they are also great cardio exercises, and good for warming up, too. Pushups – These are probably not the most favorite exercise of many people, but while they can be hard to do, you can find easier ways to do them. You don’t need to pretend you’re “Rocky”, and do them with one hand; just do what works for you. Do them on your knees, instead of keeping your legs straight. Or, do them standing up against a wall. You will be building up arm strength and working out muscles in your chest area. Leg Lifts – These are great for building up strength and muscles in your legs. If you find it hard to do the exercises with your legs straight, try bending them slightly. Crunches – The best exercise for building up and strengthening abdominal muscles. When you’re just getting started, don’t worry about getting your head all the way up. So long as you’re going up until you feel the stretching of the muscles, you will see some benefit. Jogging In Place – Jogging is a great exercise for your heart. You can jog in place at home while watching TV or listening to music. The only equipment you will require is a good pair of shoes, to eliminate any stress to your legs. Squats – These are wonderful exercises for your legs and buttocks. You can even just try these by sitting and standing up again from a regular chair, if you’re finding them to be too difficult. As long as you’re able to do a few repetitions, you will be providing some benefit to your body. Light Weight Lifting – No, you don’t need to go out and buy expensive weights for this! Just use whatever you can find in your house. Start out with something lighter, such as a can of peas, and work yourself up to heavier items. You can use milk jugs, laundry detergent bottles or even water jugs. Dancing – Dancing is a wonderful exercise, which is great for your heart. Not only that, but it can lift your spirits as well, and give your overall feeling a boost. Getting some exercise is important, but you don’t need to go out and join a gym, paying a large amount in membership fees each month. You don’t even need the expensive equipment in order to give your body an effective workout. Use what you have in your house, and work out in the comfort of your home. You will be more likely to keep up with the exercises when you’re comfortable, so just get up and start exercising! You’ve decided you’re visiting backpack throughout America and live out all of your Woody Guthrie dreams. But you just have a L.L. Bean knapsack from tenth grade, some ancient hiking boots and some outdoor tents that has even more moth gaps than you thought feasible. Before you prepare for your journey, nonetheless, you may want to get some supplies. By getting some quality hiking devices in order to live conveniently as you camp throughout the country, you can plan for your adventure and feel confident while going out into the world. Now you just need to choose the right devices that is best for you. The first thing you’ll wish is a good hiking backpack. There are hundreds of different brands of knapsacks to choose some. A few of the most durable knapsacks are Gregory backpacks, Osprey backpacks and Deuter backpacks. These are fantastic for long journeys because they are created to hold a big quantity of supplies however taking the least quantity of space. Each of these knapsacks must be effectively gauged and sized for each customer before usage. In order to make sure it is effectively sized, you should determine your shoulder width and back length in order to choose the best one for you. Tents and resting bags are important as well. By having stable shelter and a comfortable spot to rest you can be sure that you will constantly be energetic and prepared for each day. Nemo tents and Big Agnes tents are trusted during extreme climate or on challenging surface. By having such trustworthy shelter, you could rest your head any place you could and get up the next early morning refreshed. It is also exceptionally vital to choose the right bedroll for you. Brands like Big Agnes has long lasting sleeping bags and even hold a two-person bedroll for couples that are traveling. The final thing you must consider is your boots. Depending on where you are going, you’re rambling boots will keep you comfortable in even the most extreme weather condition. There are numerous different brand names to pick from however you have to discover the right pair for you. Many spots that sell hiking boots will have indoor hills and rock walls you can attempt new boots out on before purchase. Brands such as Vasque, Zamberlan and Koolaburra have long lasting boots that are excellent for many climates. They commonly have waterproof boots but if you intend on hiking in the Rockies in February MSR snowshoes can be a great choice for you. These are a large financial investment that should be taken seriously since you will be staying in these shoes for potentially months. After that, the rest depends on you. If needed, you could get probabilities and ends such as Bolle goggles, Primus stove or glacier glasses depending on the landscapes you prepare to dominate. As you travel you will be glad you purchased the right devices while hiking across the country. While it is feasible to only go from state to state with just a knapsack and a guitar, you may desire a bit more in order to stay healthy and safe. Gone are the days when all a basketball player needed to do was to lace up a pair of no-frills Chuck Taylor All Stars and run down the court to play the game. Basketball shoes have gone a long way since then. Ever since Earvin Magic Johnson and Larry Bird revived the National Basketball Association with their team-first style of play characterizing the intense rivalry of their Lakers and Celtic teams, the technology behind basketball shoes have grown by leaps and bounds. Converse initially ruled the roost, with Magic, Bird and Sixers star Julius Erving endorsing the brand. Even Michael Jordan sported a Converse when he first rose to national prominence by leading his North Carolina Tar Heels to the NCAA championship in 1981. Half a decade later, Jordan started endorsing the Nike brand. Suddenly, basketball shoes had air or gel underneath it to help lessen the impact of constant jumping and running, and design was further improved to help support a player’s ankle and soles. All these improvements come at a price. Combined with the collectible factor of the shoes, some may fetch incredible amounts. Here are the top ten most expensive basketball shoes in the world. The Jordan I had two versions. The original had a red and black design that was banned by the NBA as the rules state that shoes must have some white on them. Jordan loved the Peter Moore-designed shoes, however, and insisted on using it during games. As a result, he got fined $5,000 each game he would play with the disallowed sneakers. 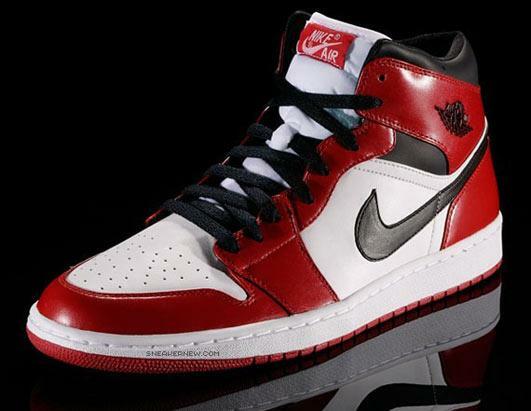 Jordan and Nike eventually relented and replaced the design with a red, black and white combination. A black and metallic gold version was released in March 1985 in Asia. Only 12 pairs were created and these now cost $25,000. In 1989, the sequel of the smash hit Back to the Future was released. Michael J. Fox, the star of the movie, sported a pair of futuristic sneakers in the film. That pair is the Nike Air Mag. 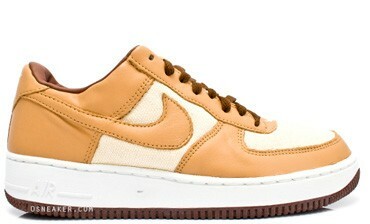 Nike eventually released it, though only 20 pairs were made. Michael J. Fox had previously appeared as a basketball player in the 1985 movie Teen Wolf, and he has been spotted watching the New York Knicks at the Madison Square Garden. Still, he is not a professional basketball player. Yet, the shoe that he made famous is the second most expensive pair of basketball shoes today. This featured a reflective tongue and clear rubber soles. It is also the first shoe that sported lace locks, thus allowing the user to easily strap the shoe. The mid sole has shark teeth shapes, which were probably copied from World War 2 fighter planes where Hatfiled drew inspiration. A version with the number 23 printed at the back in black and metallic silver was created in February 1990 specifically for Jordan and they now cost $10,000. A retail version was later released without the number 23. A pair combining metallic white and metallic silver was released in March 1985. It had pearlized leather and only 1,200 were created. This is the last of the Air Jordans with the Nike Air logo. It featured reinforcement materials in the toe area, two holes in the tongue and molded heel to protect the Achilles tendon. It came in five different color combinations, namely black/infrared, white/infrared, white/carmine black, white/sport blue and off white/maroon. 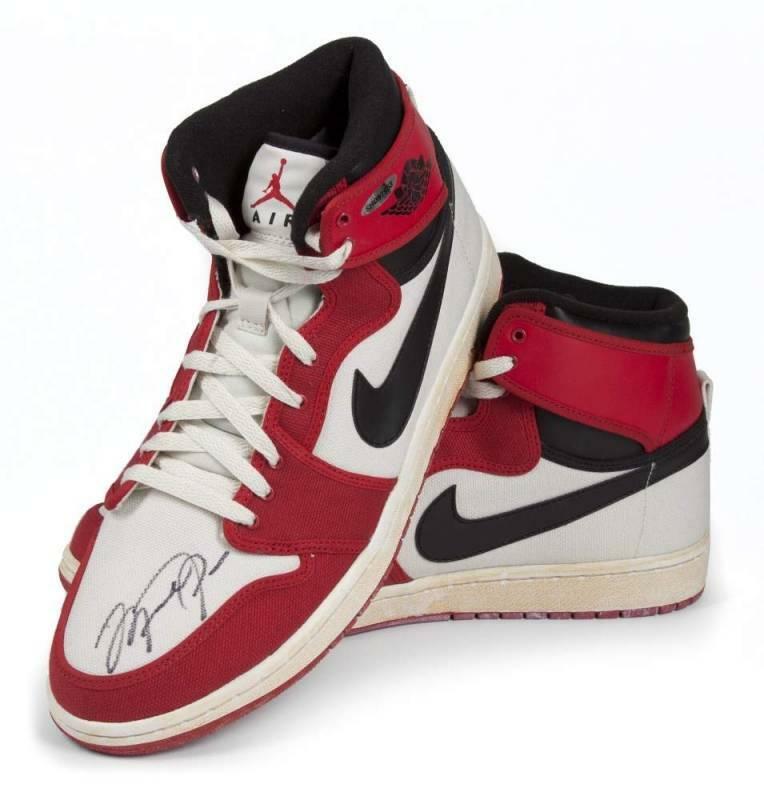 It was the shoe Jordan used when he and the Bulls won the championship against the Lakers. The white/carmine black version now fetches $7,200, as it was the color Jordan used during the 1992 Olympics that featured the original Dream Team. When the original designer of Jordan I, Peter Moore, was let go by Nike, Jordan almost went with them. 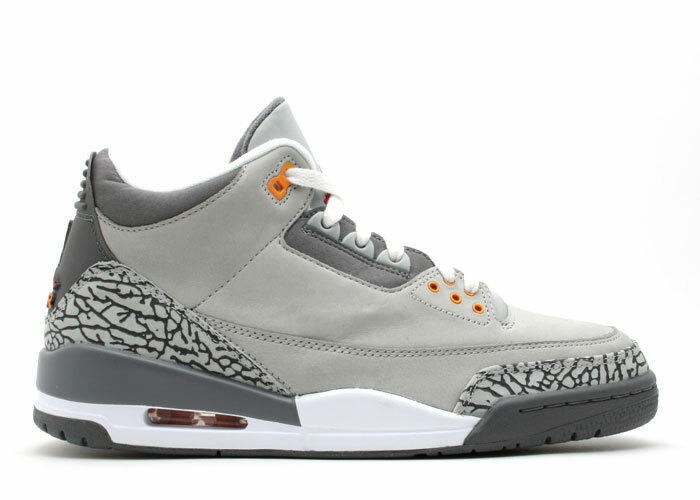 He decided to stay however after seeing Air Jordan III, the first Air Jordan designed by Tinker Hatfield. 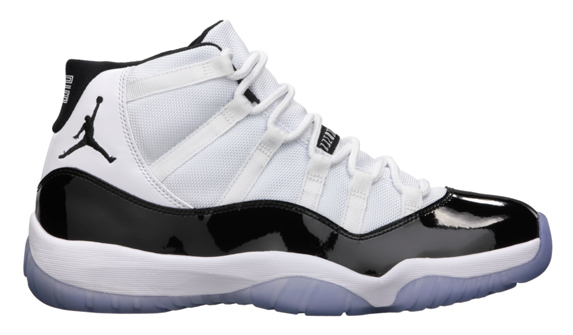 It featured the now iconic Jumpman logo, an air unit at the heel and leather finish. Jordan went on to have a stellar year, winning a memorable Slam Dunk contest against Dominique Wilkins, grabbing the All Star Game MVP award the following day, and at the end of the year, bagging Defensive Player of the Year honor. It was named KB8, in honor of Kobe Bryant’s jersey number. 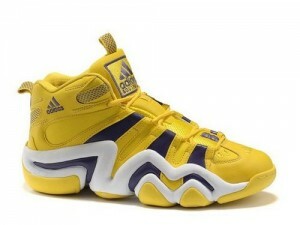 The shoe was later renamed Crazy 8 after Bryant left Adidas in 2002. Bryant is also sporting a new number now, ditching his old number 8 for 24. Only 2 pairs of the golden shoe were made and they were intended for the 1998 Slam Dunk contest. Waning interest in the contest forced its cancellation, however, and Bryant never got the chance to wear the shoe. Jordan first used this pair in 1995 when he made a comeback in the middle of the season after a brief fling with minor league baseball. Though he had several memorable games that season, particularly the buzzer beater against the Atlanta Hawks in just his fourth game back, and the 55-point game against archrival New York Knicks in Madison Square Garden, the Bulls fell short that year after losing to the Orlando Magic in the playoff. With the condura nylon top and carbon fiber plates allowing a lighter weight and better torque, Jordan used it again the following season. In his first full season back, the Bulls regained the title. He then used the shoes in his movie Space Jam with the number 45, his number in the season when he came out of retirement, printed at the back. 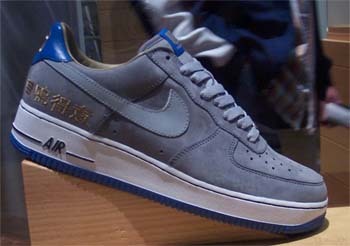 The original Air Force I was created in 1982 and have been tagged as the most influential sneakers of all time. In 2005, a black, red and gold version was released, with half going to Asia and the rest remaining in the US. It is only available in auctions or as giveaway items. Nike designed this shoe especially for LeBron James during the 2004 ESPY Awards. Less than 12 pairs were made.